What if? What if women had been eligible for the draft in WWII? What if they had been sent to the front lines? What if they had been trained and served alongside the brave young men who chose to put on a uniform and fight for their country? What if? Michael Grant explores the "what if" in his newest series starter, Front Lines. This was my first Grant novel, and it won't be my last. As always...I wish I would have waited for the series to be complete before I started. Now I have to wait for book two while our three female protagonists are fighting for their lives and country in a war. So hard. The story bounces between three young women, as the description states, who found themselves joining the ranks for their own reasons. One young woman eager to avenge her sister's death and the desire to see if she has the courage to risk her life for her country. One young woman with the uncanny ability to learn multiple languages and an eye for details. And one young woman with an impossible dream eager to learn and heal. Grant leaves the narrator a mystery, starting the story in a hospital, surrounded by the wounded scarred by the images of war. I enjoyed hearing about all three women, but the story was definitely swayed toward Rio, leaving me wondering if that was by design...will the other women play a more prominent role in installments to come? They each represent a different aspect of the war. One the soldier. One the spy. One the medic. At the end of the story, their lives begin to intertwine in a natural way. Front Lines felt real. I had to remind myself on occasion that women weren't, in fact, eligible for the draft during WWII. I had to remind myself that they never saw combat in tanks or foxholes, gun on their shoulders, taking aim at the enemy. While set during the backdrop of WWII, it's not really a war story. It's a character driven novel. Grant is telling the story of three lives that just happen to be going to war. And in the end, it's a love story. Not a romantic story. But a way to praise the ingenuity, courage, and emotional capacity of women. So in that sense, I suppose this is a very feminist story. One without a soap box. Without an agenda. And that's why I enjoyed it so much. Strong female characters can also be imperfect and vulnerable. They can be capable yet accepting of help. They can be scared and intentional. They can be quick witted and empathetic. They can be beautiful in those moments of imperfection. 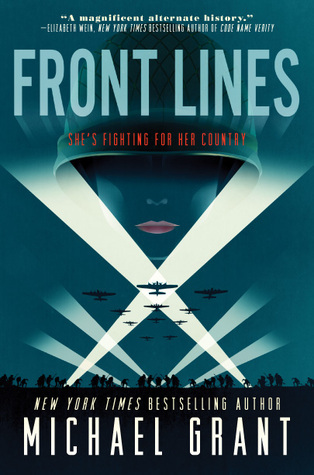 Whether on the battlefield or serving as pilots, mechanics, radio operators, or nurses, the truth is that women played an integral role in the allied victory. Grant's story might be fiction, but it has heart, and it's a story I want to see through to the end.